Innovative trends in business. Increasing your customers and clients by being more pet friendly. 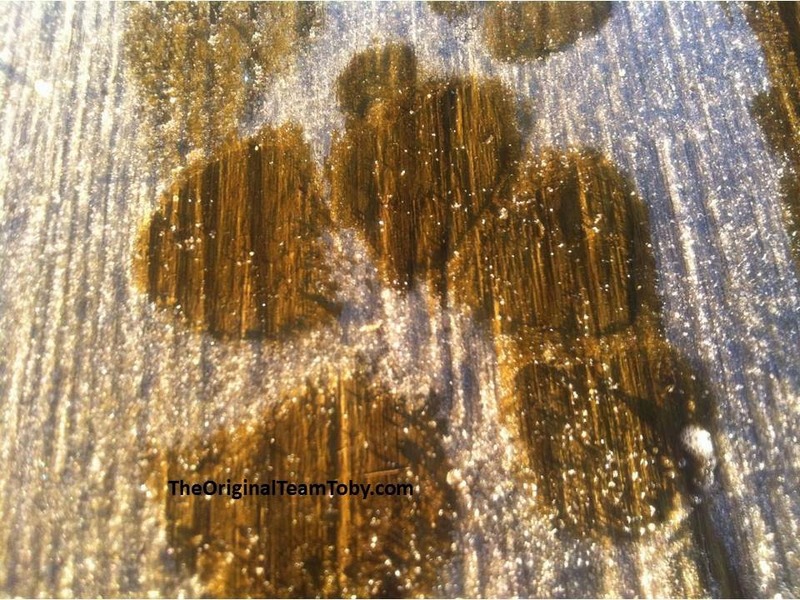 Toby, the traveling dog with a PAWsitive blog! I am on a mission to build a kinder world one paw one person at a time! A Million Acts of Kindness. There are lots of businesses out there doing great things for pet families traveling with their pets. And.... there is lots of room for businesses to take it up a notch and attract new customers and clients... like my humans. Pet Parents Traveling with Pets! Check out what mom had to say about this on her show. Mom shared even more cool tips on her Linked In Article. Tell us what your community is doing to be pet friendly! Share on our blog by commenting below, or on our Facebook page (remember to like it too), or on our Twitter. Give the businesses you love some extra attention by sharing with us. Interested in a copy of my books? Ordering is supaw simple! Just click the links. We'd love for you to buy a book and paw it forward to a school, or hospital.... kindness through the power of stories. And I am on a mission to build a kinder world...one paw...one person at a time! Dad was reading the North Shore News the other day. Our Million Acts of Kindness is our way of helping build a kinder world...one paw one person at a time. There are so many silent heroes and ambassadors of kindness who are changing the world by simply showing up as themselves, sharing smiles and acts of kindness. Together, those single actions ripple into a movement. In North Vancouver, BC a 91 year old Veteran was shopping at a Save on Foods store and as the cashier was ringing through his groceries, he discovered he had left his wallet at home. A shopper in the next isle told to his cashier and paid for his items. What a beautiful act of kindness! The gentleman made several attempts to get her name and address as he wanted to repay her. He stated that "she would have none of it!" He wrote to the newspaper to say "THANK YOU!" It is these acts of respect and kindness that touch my heart, and we see and hear about these type of actions every single day. I believe that together, through kindness, we can make a PAWsitive difference. And that by sharing the stories like these, we are reminded that kindness connects people and can have a big impact of the person receiving and extending the kindness but also on all of us as we hear about stories that have made a difference. Thank you Mark Bradwell, for sharing your story, and thank you for your courage and all you did to preserve peace and safety for us all. Sometimes you need a hand.... and you get a paw! Kindness...it's in you for giving... give lots!" (C. Hammond). Please share your stories of kindness by commenting on our blog. 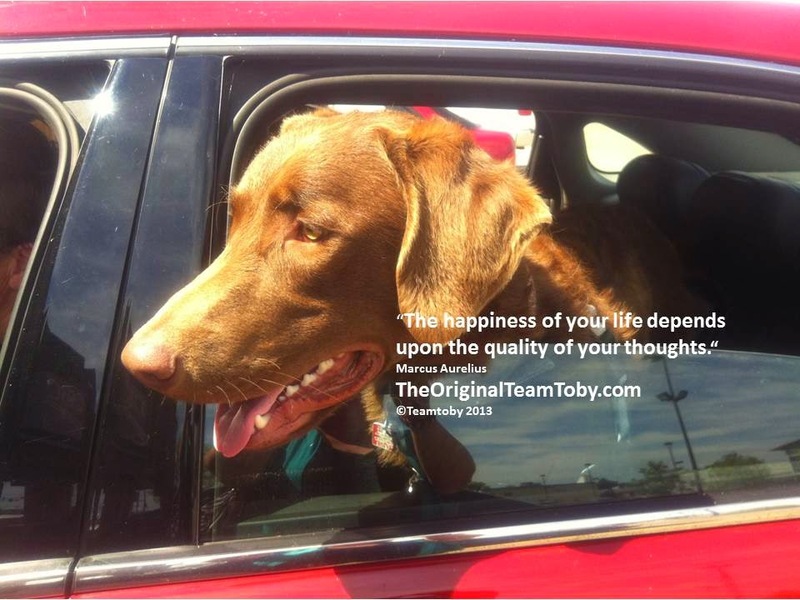 Toby the dog.... and I have a blog! We met the most pawmazing peeps and dogs at the Dogtopia Coquitlam Grand Opening on Nov 22. It's really dog PLAY care (not day care). Benefit one is lots of play and activity. Treats and lots of "good boys!" Other dogs teach you stuff! You get to be a dog! Sometimes humans forget event tho' we're their fur babies.... we are still dogs. 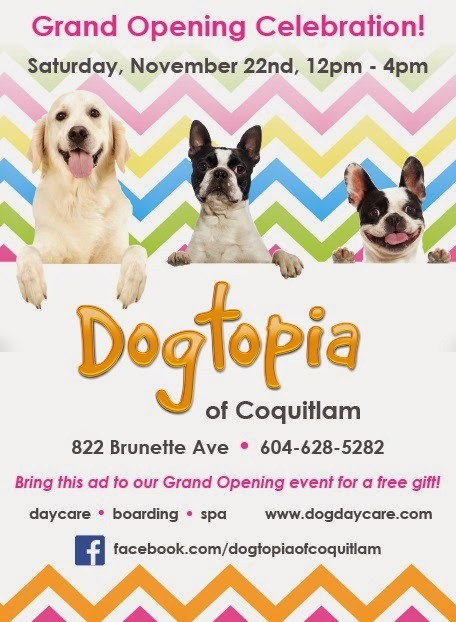 Dogtopia Coquitlam has the coolest feature! A Play Cam.... humans can log into Dogtopia when their dog is in day care and you can watch your dog playing while you are at home or work. How fun! Here I am all Toby cam'd up to film our time at the Dotopia Grand Opening. 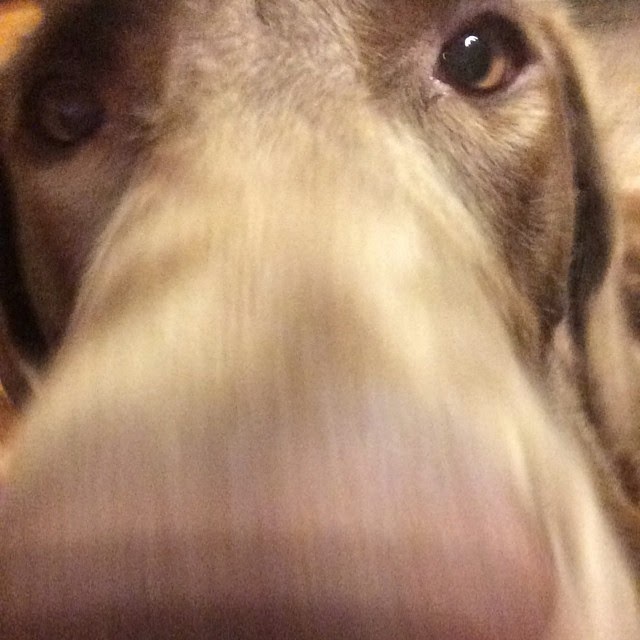 Nothing like the shots from a dog's perspective... we'll be blogging those as soon as dad downloads them. Share your fave pics of your dog in day care or your fave daycare story on our facebook page. 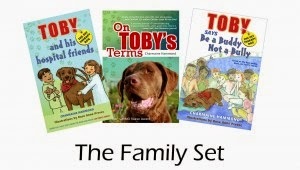 Lots of people have been asking how to get my Toby series of books for their kids and schools for Christmas. It's super easy! You can just click here to order your copy(s). Here is another one of the other books mum wrote.... great way to kickstart 2015!!!! 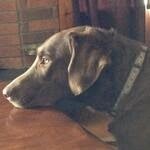 Pet friendly rest stops... your dogs need to get out and stretch just like you. Communities that have activities you can do with your pet such as walking trails, parks, dog parks, pet events. Learn where the closest vet and animal clinic are when you visit a community. Make sure that your dog tags and chips have current and up to date information. Have a current photo (headshot) of your pet on your cell phone. Just a few tips on traveling with your pets. Mom did a survey with pet families about what they want in relation to pet friendly travel. There was PAWSome feedback. She'll be doing a webinar soon to reveal the results. To those communities working hard to be pet friendly.... we applaud you! It makes a big difference for us and our humans! Toby the dog here.... today I am sitting in the background so we can honour some amazing students!! 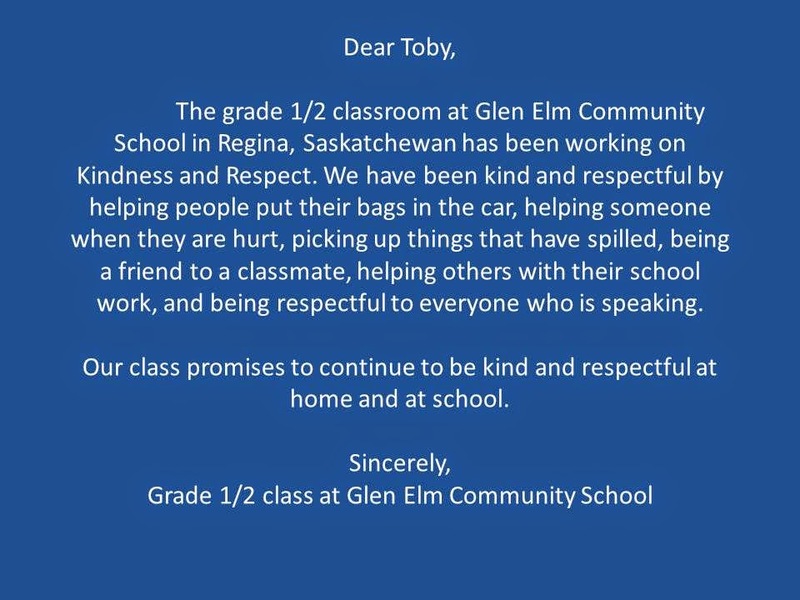 They are the grades 1 and 2 class at Glen Elm Elementary school in Regina Saskatchewan. What a great group of students!! Look how these students are being leaders and change makers! Their PAWsome acts of kindness are making a big difference!! Here's little video I made to say THANK YOU!!! Their acts of kindness were so incredible, the class has received a Toby Kindness Certificate. Thank you for inviting us to your school. And BIG BARKS of thanks for making our world a better place!! Thank you to our partners Petland Canada for sponsoring this presentation, and for helping us share our message of kindness to people, pets and the planet. A dog who NOSE best about the power of friendship and kindness. On our PAWS Across Canada Tour, we had the kind support of some North Battleford businesses with heart! These businesses are helping us raise funds and awareness for the Battlefords Humane Society, and, putting my Team Toby Classroom programs and books in the local schools in North Battleford. Their support already helped us provide an anti-bullying presentation to the entire student body at Connaught Elementary School. The Super 8 North Battleford hosted our stay in North Battleford! We SO appreciate their support. They are a dog friendly hotel with great staff, a big welcoming smile and supPAW places to go for a walk. These walking trails are PAWSome!! And minutes away from the Super 8 Hotel. And another big bark out to Just 4 Pets Supplies and Services, a North Battleford Business. 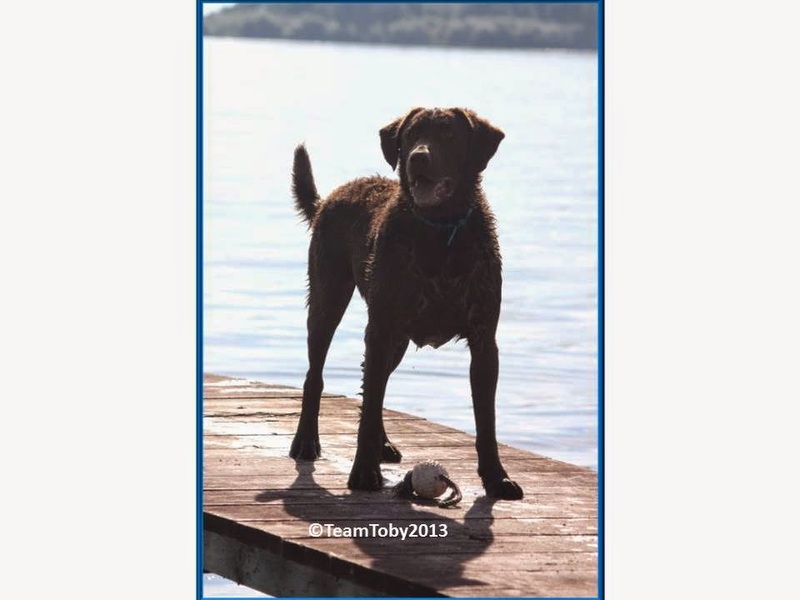 They are also helping us raise funds and awareness through participating in our Twoonie for Team Toby campaign raising funds for the Battlefords Humane Society and putting my books and anti-bullying classroom resources into the schools. We enjoyed our visit with Katie while we were in town. Katie- Just 4 Pets Supplies and Services.... Look at the fundraising they had already started on the second day of the tour. thank you! The Battleford Daily News did a pawsome article too! the media plays such an impawtant role in sharing our message of kindness! Thank you to our North Battleford champions, partners and hosts! We appreciate you! 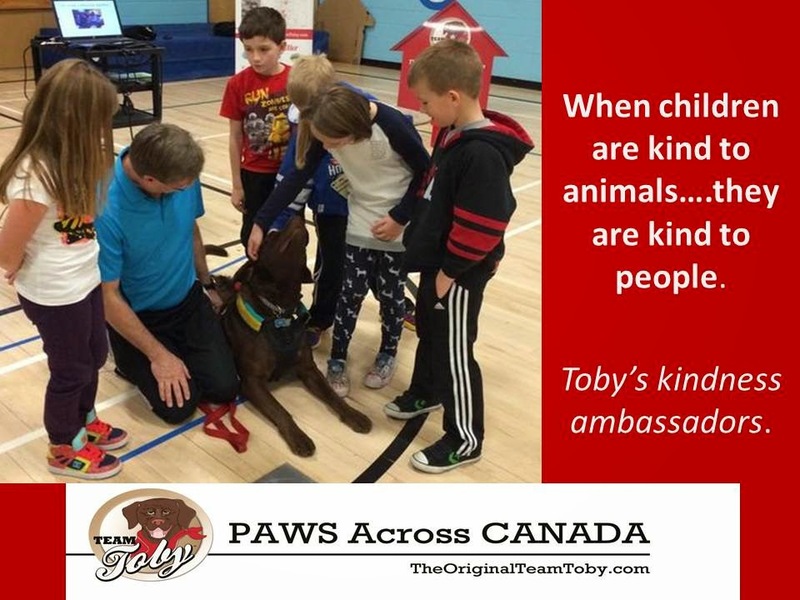 Sending some Toby appreciation to our PAWs Across Canada Tour partners for being so PAWmazing! It takes a team to build a kinder planet. 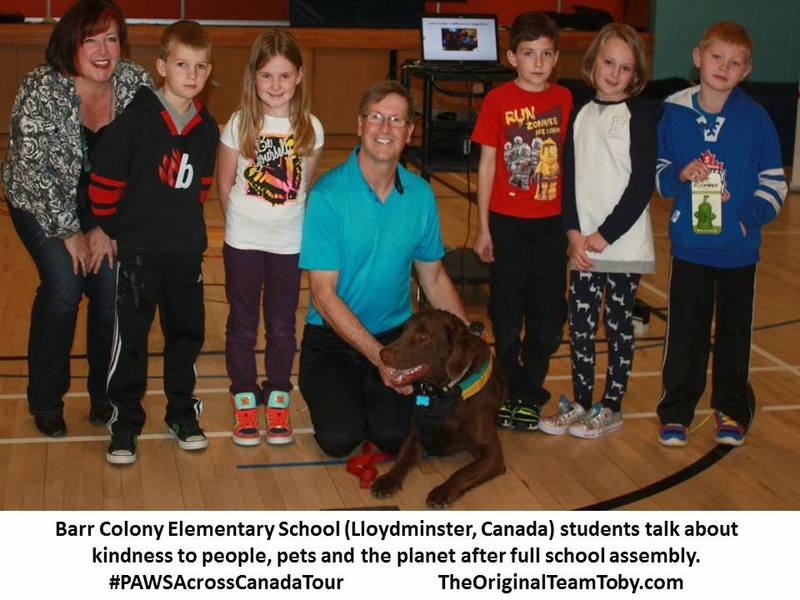 We've been on our PAWS Across Canada Tour through Saskatchewan and Manitoba, and what a team we have!! Today I am sending some PAWsitive feedback to our team in Lloydminster in Canada. We kicked off the tour there. Our school presentations were at Barr Colony School, what a pawsome kind group of teachers and staff. The Microtel Inn & Suites hosted our stay in Lloydminster. They are a Big Time Pet Friendly Hotel....so pawsome we gave them a Toby Tested Toby Approved Award. Our community champion, Katlin with the Lloydminster Economic Development Association was the person who connected us to the Microtel... see building communities and spreading kindness is all about connections! The Meridian Booster did a great article about our visit to the community, as did the Lloydminster Source newspaper. 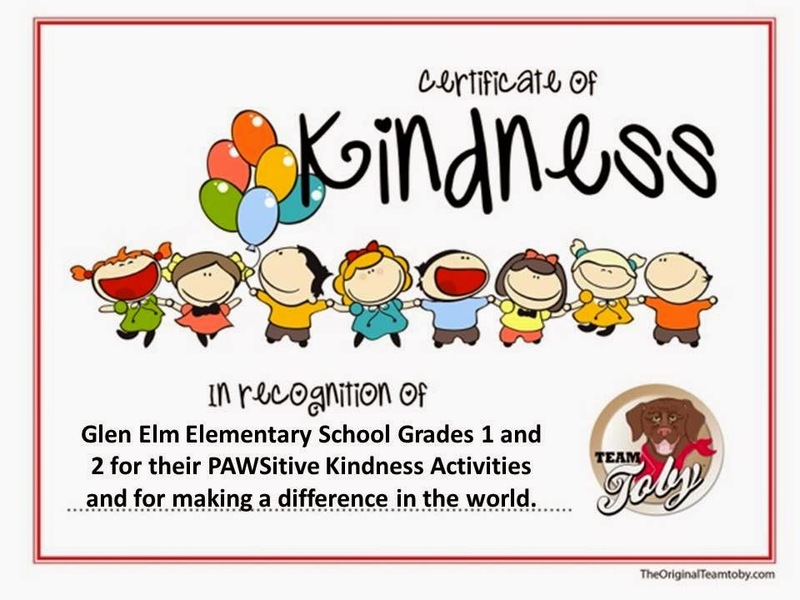 We so appreciate their 4 paws up helping share our message of kindness. Wait till you see the video we created with these five PAWmazing students talking about how to change the world and build more kindness..... coming soon! Thank you to our Lloydminster partners, champions and hosts! We appreciate you! Please subscribe to and share our blog, comment and follow us on social media.... together we can make a PAWsitive Difference! 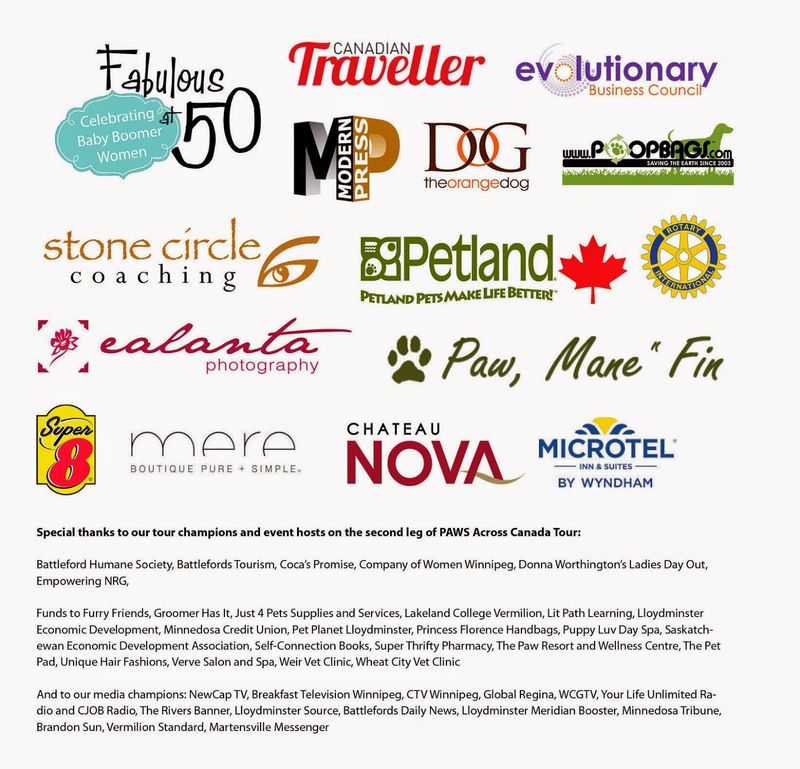 Barking out some love and thanks to our PAWS Across Canada tour partners! You helped us make a big difference and a kinder planet.